"Here!" RJ proudly thrust the fat caterpillar toward me. 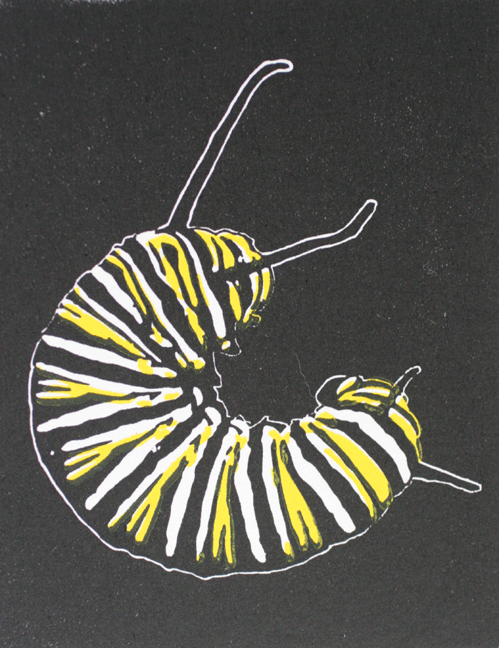 "Monarch" he pronounced in the terse, informative tones of childhood. He knew his insect larvae, for sure: this was indeed Danaus plexippus, the Monarch of butterflies. He was, like me half a century ago, a capable and practiced hunter. 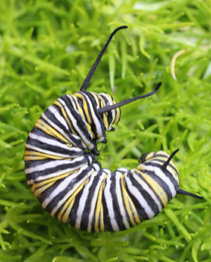 His reputation for finding these caterpillars was well known in the local neighborhood. "Wow! Where did you get that!" "Right here!" he gestured confidently toward an Asclepias tuberosa, butterfly weed, in Terry's garden. RJ was Terry's next door neighbor, a boy Terry had seen grow up from infancy adjacent to this paradise of insect infestation. RJ's parents had carefully cultured their inquisitive son to be gentle to the fat grubs, and he was well schooled in the mysteries of metamorphosis. He had seen them transformed into jade and gold capsules, sessile creatures that he had witnessed give birth to splendid aerial voyagers. "Can I photograph it?" I asked as he gently handed over the treasure. "Sure," but he was already off in search of more.